Auctions can be massively exhilarating and exciting experiences, especially if you’ve seen a property you love and ultimately end up getting a fantastic deal on it. Often you will find a huge variety of properties available when you visit an auction. They could be there because of their unusual or unique features, because they need a bit of TLC, or are bound by structural or legal issues that make them difficult to sell the traditional way. People sometimes prefer auctions these days because of the reduced time that it takes to make a property your own. Purchasing a property by private treaty can take months and comes with the risk of things falling through before contracts are exchanged. At an auction, once the hammer has fallen, that property is contractually yours! It’s because of the finality of this, that it’s a big decision to make when you bid for a property at auction, so the secret is to go prepared. Here’s our Readings guide to buying at auction to show you how. Requested a copy of the catalogue in advance and studied it carefully. Once you’ve identified which lot you want to go for, check the details, do your research, ask for opinions from neighbours and local estate agents, perhaps even carry out property and land searches of your own. Request a legal pack which should contain information such as title deeds, searches and leasehold information and get legal advice on any bits that you are unsure of. Take a builder or architect with you to any viewing – they will be able to spot any potential issues and tell you how much they will cost to repair. Compare the guide price with the price of other similar properties which are on the market and in the same sort of condition. The guide price may seem low, but this is just a starting point which is there to entice bidders, so have in mind what a realistic market value of the property would be. Make sure you have arranged your finances before you bid and know that they will be available, for instance agree a mortgage in principle. You will be expected to pay 10% of your winning bid on the day and the other 90% in the next 28 days. If it’s your first time bidding at or even attending an auction, it can feel like quite a daunting occasion. If you’re one of the people who is bidding, you’ll want to feel as confident as you can so that you don’t end up making any decisions you regret or losing out on something because your nerves got the better of you! This is why it’s often a good idea to make sure you have been to an auction before as a spectator so that you will have an idea of what to expect before the big day. You’ll always be welcome at one of our auctions (usually held in our super premises here on Granby Street). You don’t have to bid-just come along, see how it works and help yourself to our free coffee, tea and biccies! Get there early and get a good seat where you can clearly be seen by the auctioneer. These places can get crowded, so make sure you are visible. You’ll need to register once you get there and also remember to take two forms of ID, which you will need to present should you get the winning bid. Once the bidding starts it can be quite a rollercoaster, so don’t get carried away and end up regretting it – have a figure in your head that you don’t want to go past and try to stick to it. If the lot that you’re bidding for doesn’t make its reserve price then that doesn’t have to mean that you’ve missed your chance. At the end of the auction the auctioneers can act as agents on behalf of the vendors and agree a price with you based on the highest bid. 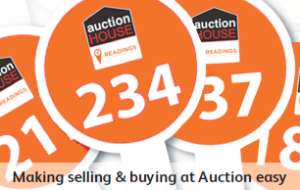 At Readings we run the Auction House Leicestershire franchise. Our auctions are always well attended and buzzing with energy, because of the wide range of interesting lots that we often have available to bid for. This, combined with our years of expertise and experience in the field, makes us a popular choice for anyone looking to buy at auction. Get in touch with us today to request a catalogue to find out more.